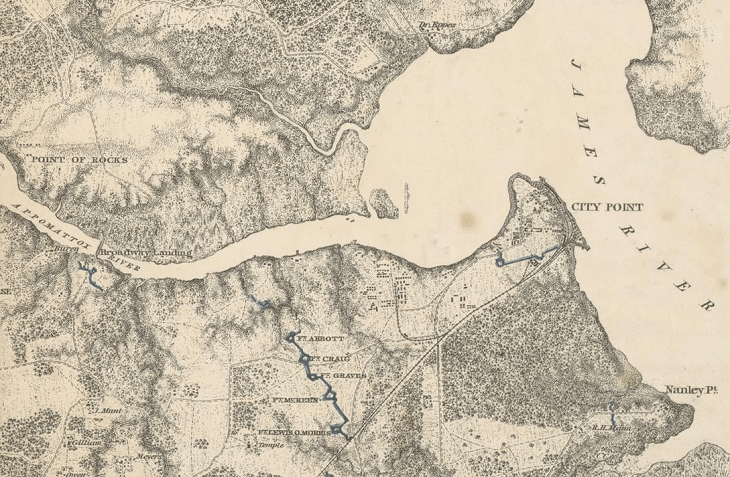 August 9, 1864: Explosion of Supply Barge J. E. Kendrick at City Point, Va.
Five minutes ago an ordnance boat exploded, carrying lumber, grape, canister, and all kinds of shot over this point. Every part of the yard used as my headquarters is tilled with splinters and fragments of shell. I do not know yet what the casualties are beyond my own headquarters. Colonel Babcock is slightly wounded in hand and 1 mounted orderly is killed and 2 or 3 wounded and several horses killed. The damage at the wharf must be considerable both in life and property. As soon as the smoke clears away I will ascertain and telegraph you. A barge laden with ordnance stores was accidentally blown up just now while lying at the wharf. There has been considerable destruction of property and loss of life. No officers were killed. The shock was terrific, and of course unlooked for. It is probable we shall never know how the accident occurred. One of your office wagon horses was killed. We are clearing away the ruins at the river. It was just as the Confederate saboteur, John Maxwell, had hoped. Maxwell had left Richmond on July 26, accompanied by a guide, R. K. Dillard. His mission was to take a the “horological torpedo” (i.e. a time bomb) he had invented, and use it against Union shipping on the James River. Maxwell and Dillard ended up in City Point on the morning of August 9 via Norfolk, where they had learned of the massive number of supply vessels gathered near Grant”s headquarters. Dillard remained behind while Maxwell found an opportunistic target in the form of the supply barge J. E. Kendrick. The ship’s captain was absent, and the barge was packed full of ammunition. Maxwell convinced a sentry to have someone bring “the package”, his bomb, aboard. Before he handed it over, he activated the bomb, and retired to a bluff with Dillard to observe what effect, if any, his bomb would have. As you’ve read above, the effect was spectacular. The explosion completely obliterated the Kendrick, another barge, and a building on the wharf. An image of the area after the explosion can be seen below. CAPTAIN: I have the honor to report that in obedience to your order, and with the means and equipment furnished me by you, I left this city 26th of July last, for the line of the James River, to operate with the Horological torpedo against the enemy’s vessels navigating that river. I had with me Mr. R. K. Dillard, who was well acquainted with the localities, and whose services I engaged for the expedition. On arriving in Isle of Wight County, on the 2nd of August, we learned of immense supplies of stores being landed at City Point, and for the purpose, by stratagem, of introducing our machine upon the vessels there discharging stores, started for that point. We reached there before daybreak on the 9th of August last, with a small amount of provisions, having traveled mostly by night and crawled upon our knees to pass the east picket-line. Requesting my companion to remain behind about half a mile I approached cautiously the wharf, with my machine and powder covered by a small box. Finding the captain had come ashore from a barge then at the wharf, I seized the occasion to hurry forward with my box. Being halted by one of the wharf sentinels I succeeded in passing him by representing that the captain had ordered me to convey the box on board. Hailing a man from the barge I put the machine in motion and gave it in his charge. He carried it aboard. The magazine contained about twelve pounds of powder. Rejoining my companion, we retired to a safe distance to witness the effect of our effort. In about an hour the explosion occurred. Its effect was communicated to another barge beyond the one operated upon and also to a large wharf building containing their stores (enemy’s), which was totally destroyed. The scene was terrific, and the effect deafened my companion to an extent from which he has not recovered. My own person was severely shocked, but I am thankful to Providence that we have both escaped without lasting injury. We obtained and refer you to the inclosed slips* from the enemy’s newspapers, which afford their testimony of the terrible effects of this blow. The enemy estimates the loss of life at 58 killed and 126 wounded, but we have reason to believe it greatly exceeded that. The pecuniary damage we heard estimated at $4,000,000, but, of course, we can give you no account of the extent of it exactly. I may be permitted, captain, here to remark that in the enemy’s statement a party of ladies, it seems, were killed by this explosion. It is saddening to me to realize the fact that the terrible effects of war induce such consequence; but when I remember the ordeal to which our own women have been subjected, and the barbarities of the enemy’s crusade against us and them, my feelings are relieved by the reflection that while this catastrophe was not intended by us, it amounts only, in the providence of God, to just retaliation. This being accomplished, we returned to the objects of our original expedition. We learned that a vessel (the Jane Duffield) was in Warwick River, and with the assistance of Acting Master W. H. Hinds, of the C. S. Navy, joined a volunteer party to capture her. She was boarded on the 17th of September last, and taken without resistance. We did not destroy her, because of the effect it might have had on the neighboring citizens and our own further operations. At the instance of the captain she was bonded, he offering as a hostage, in the nature of security to the bond, one of his crew, who is now held as a prisoner of war on this condition in this city. In the meanwhile we operated on the James as the weather and moon co-operated, but without other success than the fear with which the enemy advanced, and the consequent retarding of his movements on the river. We neared success on several occasions. Finding our plan of operations discovered by the enemy, and our persons made known and pursued by troops landed from their boats at Smithfield, we deemed it best to suspend operations in that quarter and return to report to you officially our labors. Your orders were to remain in the enemy’s lines as long as we could do so; but I trust this conduct will meet your approval. The material unused has been safely concealed. I have thus, captain, presented you in detail the operations conducted under your orders and the auspices of your company, and await further orders. Very respectfully, your obedient servant, JOHN MAXWELL. 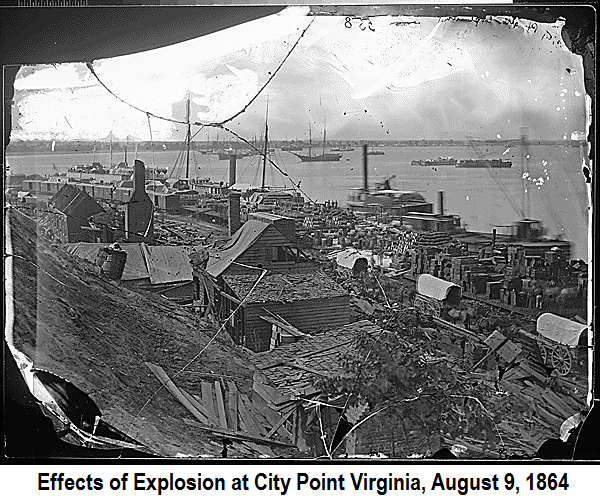 Although Maxwell’s report wasn’t discovered until after the war, the explosion did cause changes at City Point. The ordnance depot was moved away from the river and was more heavily guarded. City Point was back up and running as if nothing had happened barely over a week later. Like the Crater explosion and the Confederate mine explosion in the previous week, this explosion was spectacular in its visual and auditory effects, but ultimately had very little impact on the Siege of Petersburg.